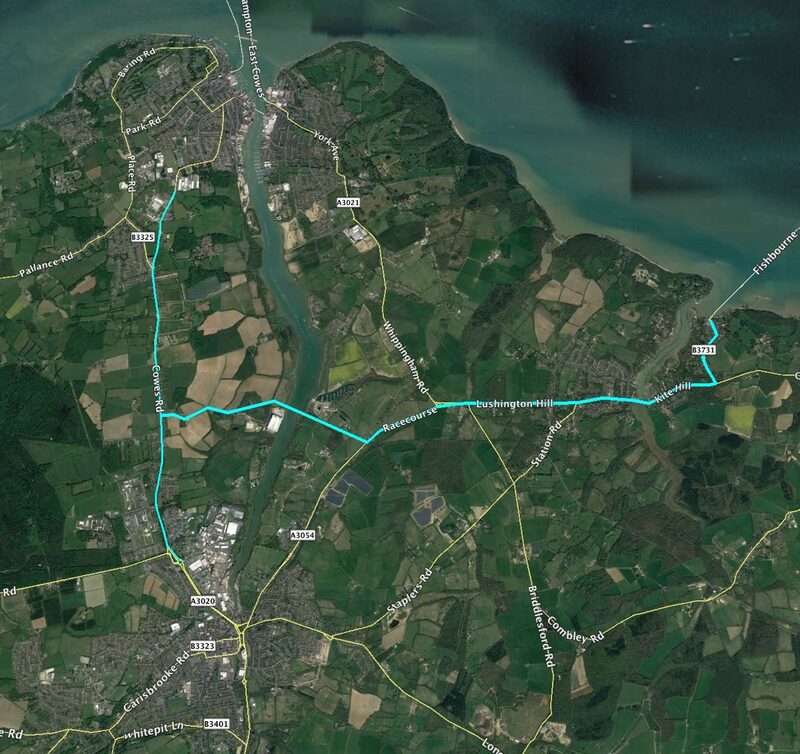 PRO-LINK believes that the radical repositioning and replacing of the East Cowes and Fishbourne vehicle ferry terminals ….. to a tunnel portal at Whippingham, presents incredible opportunities to reduce congestion and provide 24 hour, free flow of personal and public transport. The mainland has incredible opportunities to enjoy even greater benefits within the proposed scheme… but this particular web page concentrates in summary, on just some of the island benefits. PRO-LINK is suggesting a scheme that will provide road based personal and public transport… 24 hours a day, 365 days of the year. There will be no requirement to book and there will be no schedules. The flow of traffic will be managed via ANPR, CCTV and GPS tags. Toll payments will be automated and there will be no requirement to stop. 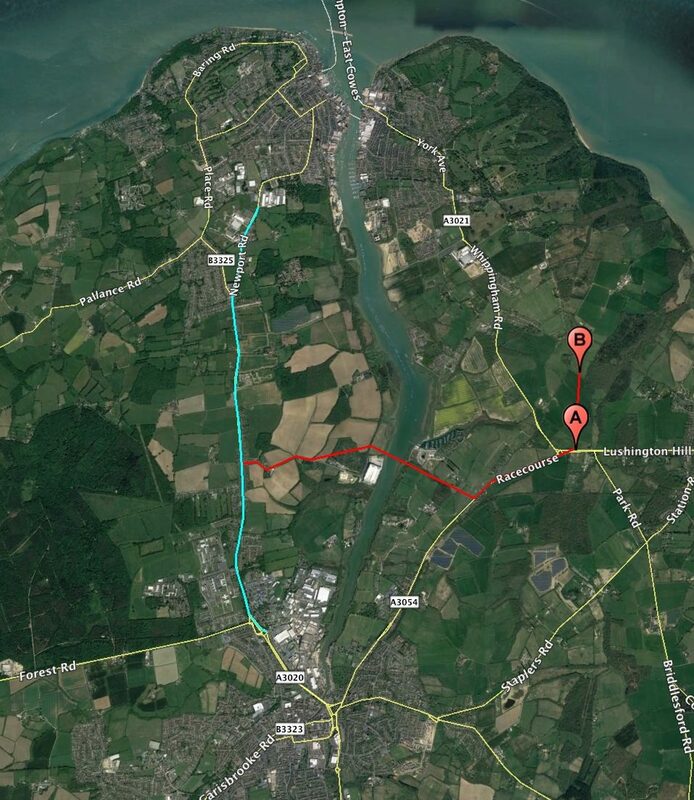 Traffic from Whippingham will travel 11kms (8 minutes) to the first exit portal option at the mainland coast near Lee-on-the-Solent… or alternatively, progress 3.9kms (4 minutes) onwards along with mainland traffic underground, to the third portal …. 900 metres from the M27. Traffic will literally disappear between Whippingham to the M27. The PRO-LINK ideas are designed to stimulate sensible and constructive responses and comments, which can be submitted and published at the end of this page. It is intended as a form of initial public consultancy. Once the Fixed Link scheme has been finalised both on the South and North island (“mainland”)… viability first and then environmental and social impact studies will need to be undertaken. 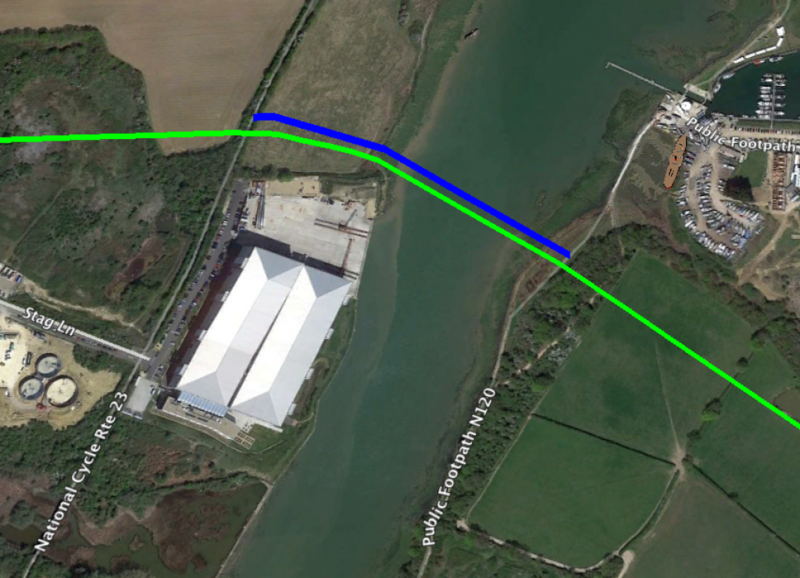 The Portal position at Whippingham will create an average 40% distance saving as compared to using existing ferry ports. Even without a Medina crossing, the distances saved will be considerable. General reduction in South and West bound journey distances by road. Considerable reduction of traffic using the East Cowes Road. The ability to easily connect an ongoing tourist rail link to the portal area, which is not possible with the ferry port positions. 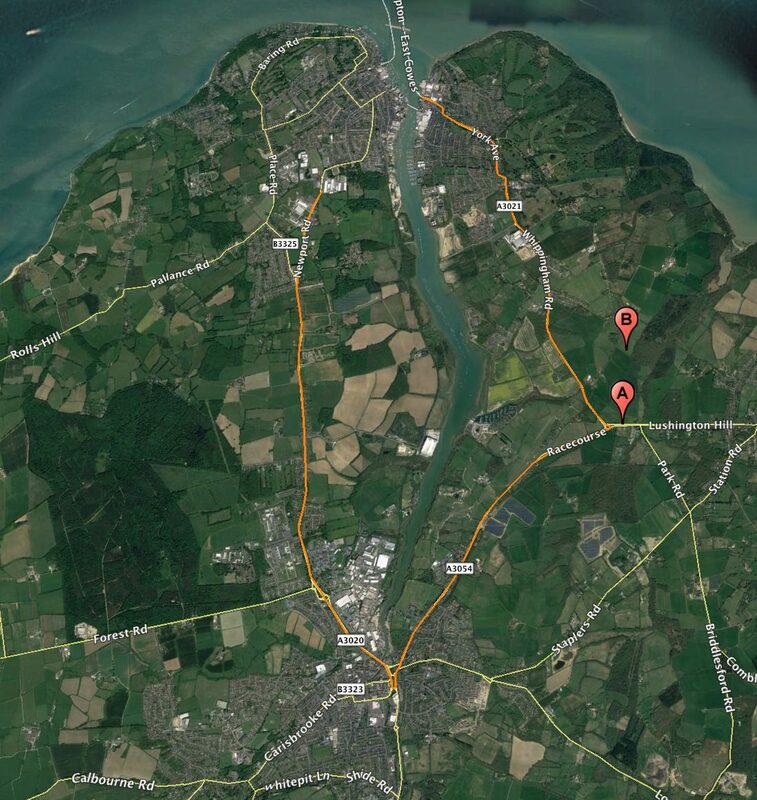 Opportunities to regenerate East Cowes and Fishbourne sensitively with no requirement for marshalling yards. Future proofing for efficient, autonomous modes of personal road based transportation and automated public transportation. Environmental benefits considering the removal of polluting stationary and marshalled HGV traffic at ferry ports. Environmental benefits considering the removal of noisy marshalled traffic / refrigerated units at ferry ports. 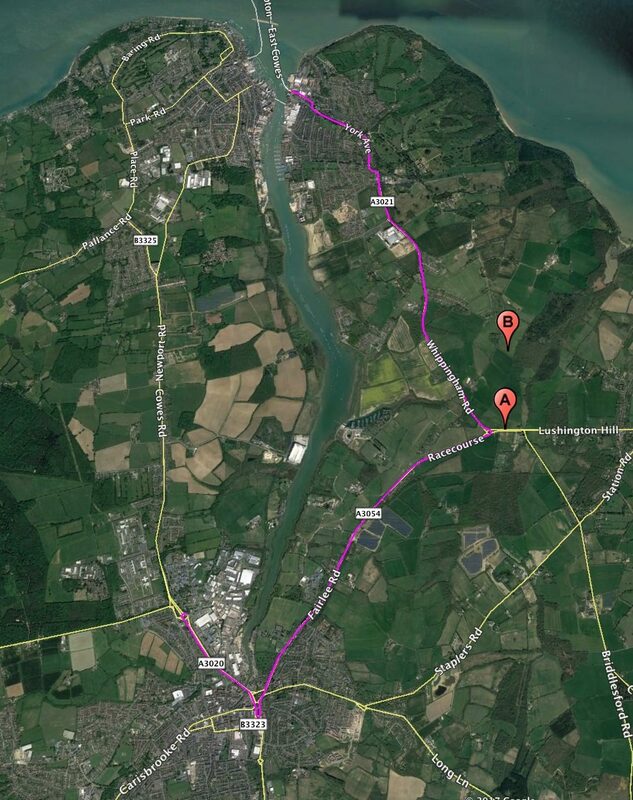 A longer journey distance to East Wight when compared from Fishbourne Ferry Port. 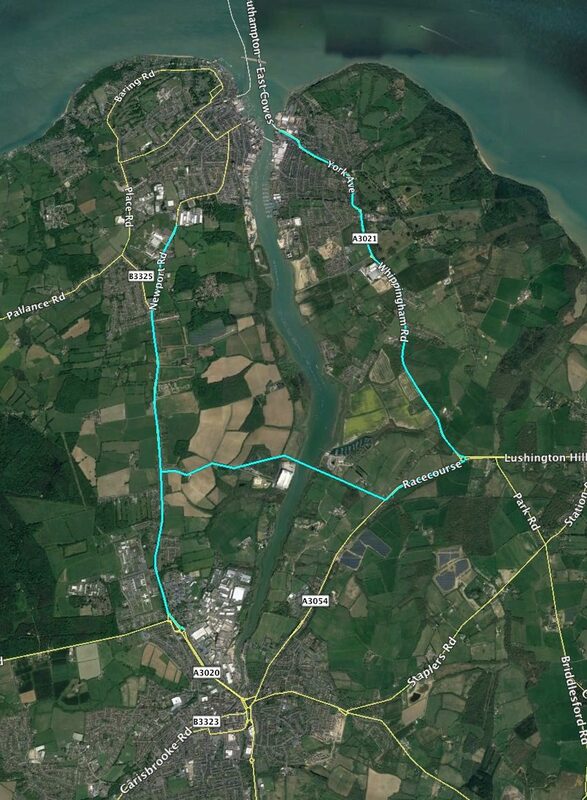 The extra distance = 3km from the portal to Fishbourne. The utilisation of fields at Whippingham to construct the portal, access roads and public transport terminal. The extension of the railway line would finalise South of Lushington Hill road. Passengers would be able to board having arrived by bus or taxi through the tunnel and visa versa. The new Steam Railway Station would offer a tourist schedule of between 30 minute and one hour intervals. It would integrate within the new “Lushington Transport Hub” that would transfer the “dedicated tunnel transit bus” passengers to other options of electric car / electric bicycle hire… a bus terminal to travel onwards to destinations with the now more viable island bus service… and also a taxi rank. Benefits of the “Lushington Transport Hub”. An ideal opportunity to produce multi mode public transport at point of portal entry or exit using primarily existing routes. Immediate passenger transfer from transit bus or taxi to multi mode transport at point of portal entry or visa versa. Tourists, etc can transfer to Island line trains at Smallbrook, to continue on to Shanklin perhaps. A potentially viable train alternative to road based transport to / from more populated areas to / from point of portal entry. A scenic train journey destination for tourists. No compulsory purchase orders on homes or businesses envisaged in order to construct the hub or railway line. Financial success for the Havenstreet Railway Charity. As the work to provide the rail may be considered too expensive initially, it may need allowances to be done retrospectively. In the case of “9” being applicable, transport from the “Hub” to Wootton Station, may be the initial solution. A rail crossing will need to be re-established at Station Road in Wootton with considerable excavation required. A cut and cover tunnel may be required to connect East and West of Station Road. The cycle lane will need to be re routed or the track area made wider to accommodate cyclists / walkers. 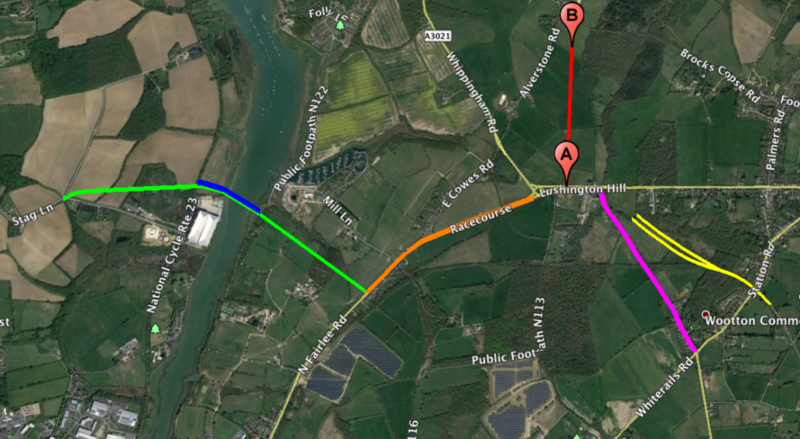 NE – NW traffic will be directed away from Coppins Bridge in Newport. Considerable time savings on journeys. The provision of a dedicated cycle / walking track will create a healthy alternative to driving between North East and North West Wight. Provides a quick connection between two arterial cycle routes. Provides the capacity to cope with Newport and Medina Crossing bound traffic. Dual carriageway will not be required once the traffic radiates at each end. Road widening will create more capacity while maintaining safety. Improved junction roundabout connecting to Briddlesford Road. Overview of personal and public transport improvements…. The Medina Vehicular crossing, connecting Fairlee Road with Stag Lane (Green). 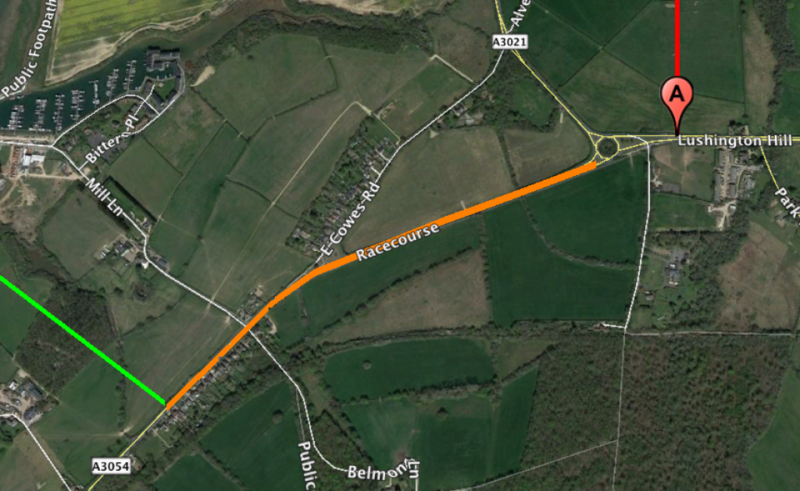 A new section of Dual Carriageway (Orange). Provision of cycle track and walkway across the Medina (Blue). 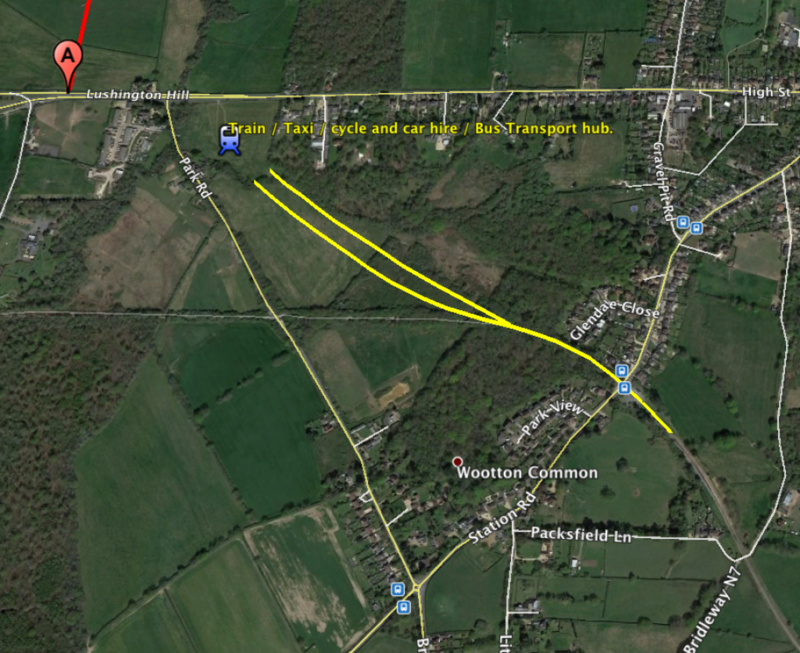 An extension to the original railway from Station Road to the “Lushington Transport Hub” (Yellow). Improvements to Park Road (Magenta). New roundabout junction to provide capacity for tunnel traffic at “A”. Dual carriageway from B to A. Please leave any constructive comments in the comment box below? Why does a new roundabout need to BT constructed at Point A? There is already one just meters away which could be upgraded/enlarged. That may well be an option also Richard. 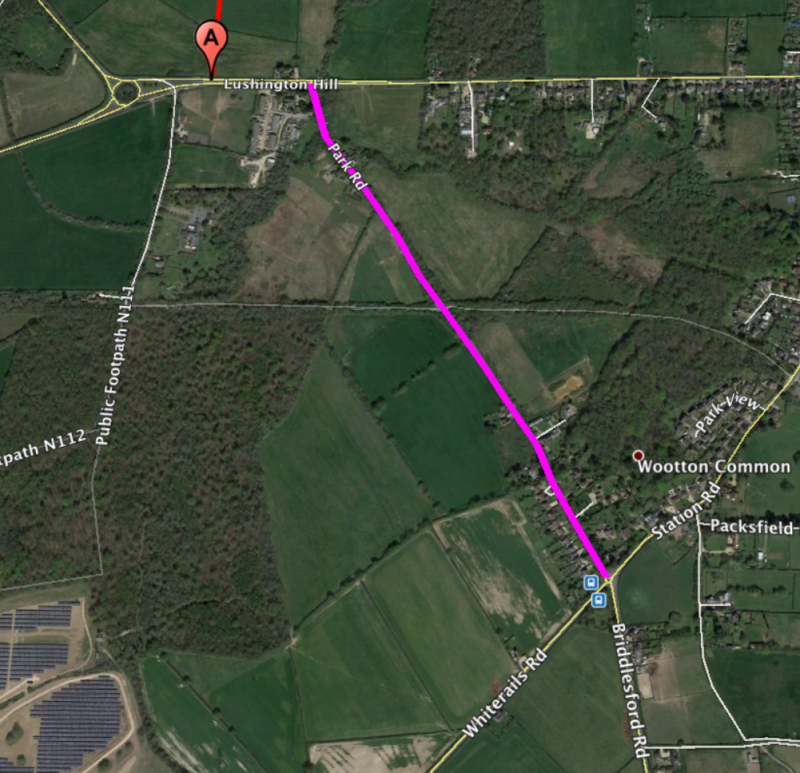 A round about with a dual carriageway would need to be much much larger than the one at Whippingham. So the current plan is one roundabout leading onto yet another roundabout. Good traffic flow thinking…NOT! Also, no mention of a roundabout that would be required on Fairlee to bring traffic right onto bridge and down the single lane Fairlee road from that point. Again this would be a large roundabout, taking out the houses. The bridge is also to be a toll and closed overnight. There are a great many details that need to be discussed Colin. For instance, the peripheral infrastructure may now need to also accommodate the lately mooted new football stadium at the ‘Race course’ location. The Medina Bridge would be in 24hr operation. It would be a simple unstaffed road so there would be no requirement to close it at night. One staff member would only be required twice a day to open the bridge to let large vessels through at high tides. Yes, in order to repay capital costs on construction, there may need to be a toll, but far less than the present day chain ferry at West -East Cowes. A tunnel will be brilliant, I.O.W is my favorite holiday destination and my uncle and cousin live there. The Ferry makes it hard for me because of the price or bad weather. I usually travel very late or in the night which isnt easy when your tired.i would be able to visit more often if i could drive through the tunnel at a more convenient time . What’s the price of all this ?! Where is the funding coming from,and what’s going to be the cost of the crossing to and from mainland,and the cost of going over the median river new brige. And would it employ island people and remember the ferry company’s,have our council in there pockets and the older people on the island would block it,as they are stuck in there ways,but most of them aren’t Islanders anyway. The price is uncertain at this stage but complete project estimates are around £3billion Clive. £2billion is expected from private finance via toll revenue. The rest is expected from the UK government once we have proven the other revenue streams to UKPLC from this project. It is expected that the Medina Crossing will be tolled initially to recover construction capital. The automation of the SF tunnel and M crossing means minimal staffing which in turn reduces tolls. It would be unreasonable to say that any/all employees would be solely from the IOW. Great plans for the Island.. well done Carl and everyone else involved in giving us freedom of moment and improving traffic flow. This island is and will always struggle unless these plans are given the go ahead. 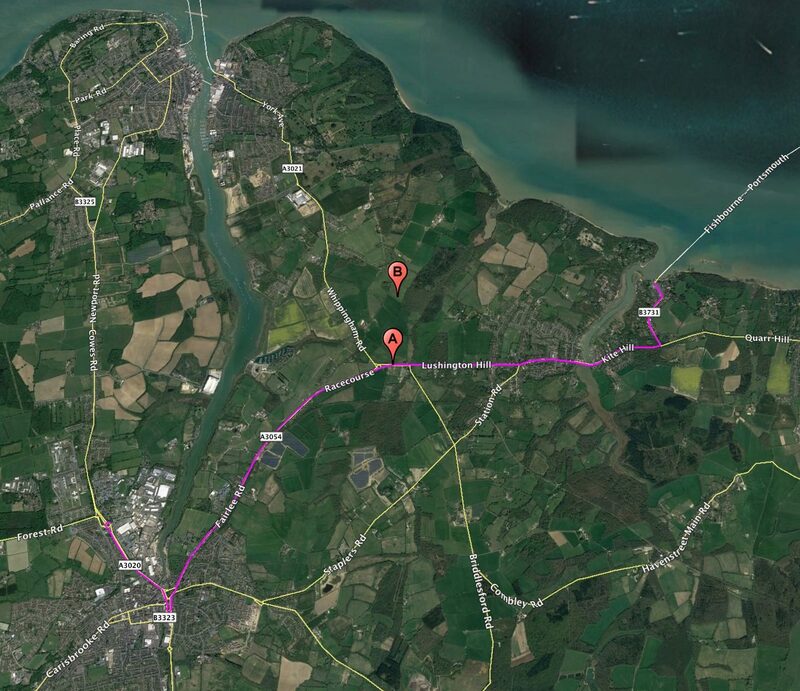 The island desperately needs this fixed link and the freedom of movement. Not just for people living here, but also industry. Until we get the fixed link we will never have the industry our young need to keep them living and working here. This is something the mainland takes for granted. We don’t have that luxury on the island. We are controlled and kept on the island by the ferry companies and this cannot continue. I look forward to the day I can come and go as I please to see family and family come to visit. Yes I agree. That has now been fixed. Thank you Terry. I think these plans are well thought out and provide solutions to several traffic flow problems on the island. I believe the easier transport link would increase visitor numbers and regenerate island businesses that currently suffer through lack of any island marketing or tourist information. Having a fixed link might also encourage employers to pay market rates for jobs that are higher paid on the mainland, thereby attracting and encouraging better qualified staff. I work in the NHS and there are lots of problems associated with being an island trust from attracting and retaining professional staff, to patients having access to services and requiring transfer at considerable cost to mainland hospitals. For my part, the biggest plus point as an island resident, is having the freedom to get on and off the island whenever suits making it much easier when going on holiday (and returning), to access department stores that cannot afford to base themselves over here, and being able to visit family and friends on the mainland without costly ferry fees and having to book in advance. It can’t happen soon enough for me and believe the benefits of having a fixed link far outweigh the negatives. If this pie in the sky idea had any chance don’t you think Gosport or Fareham council would of already put a tunnel in to M27 to ease the hours delay every morning or night rush hour? Yea might be great to have a fixed link but can someone name a place on the mainland which doesn’t already have traffic issues or protected land. Also the cost by the time they really considered it that 3 billion will be more like 10 billion+ that is just to build the fl from iow to main land not the cost of tunnelling under Fareham. Any extra fixed links would be a bonus so we simply have more options to get around easier,without the queues when there are events on ,and holiday seasons arrive and it becomes grid locked here ! As to where they should be placed it will depend on any protests or others rights of way,probably.but we had all this decades ago and nothing has happened ! Yes Kenneth… in the past, campaigns have been less organised and have lacked continuity. This campaign will continue for as long as it takes. We also now have the benefit of social media to overcome the vested interests of influential institutions and individuals that have prevented Fixed links in the past. We now have a process of exposing these vested interests. WHY are all the measurements in Km for distance. When we use MILES for distance in both the South and North islands ?? in the interest of simplicity, all measurements must be in KM and metres…. as industry costings for lineage is now done in this format Robert. How about a tunnel to America while you are at it or Australia you have more chance of that as at least they have land which won’t cause congestion How many years has Gosport/Fareham council been trying to get better road network to M27 but can’t because of land restrictions. Surely if your idea would be allowed or worked the council there would of already done it to ease the hours congestion every day they already counter. This scheme takes the arterial road under Gosport and Fareham. Therefore, very little surface land is affected… traffic and the road will not be seen, or heard. Pollutive particulates can also be filtered within the ventilation system. It will be good for the island,getting on and off for work is great instead of getting ripped off by the ferry company that lets dogs urinnate all over the floors and stinks it gives they young people chance to get jobs or even better jobs and have easy access on and off . Need to think of the future and this is a good one. Line of route is important. 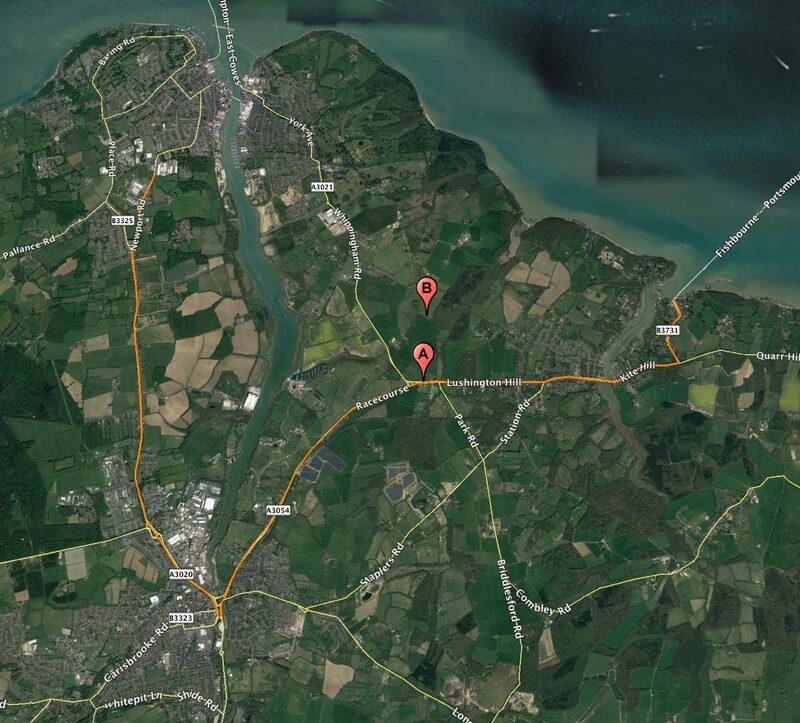 85% of the islands population lays to the West of West Cowes if you draw a line North to South. To have that population heading West to Yarmouth would create long journeys and thus greater traffic. The same on the mainland side too as most traffic would be heading East to the more populated areas. The position at Whippingham is ideal to reduce journey lineage, time and traffic. I am a registered blind person so I have to listen to the text rather than see the maps. Nowhere do I hear at what height above the high tide on the Medina will the bridge have to be to allow the same access to Newport Basin as at present. The second question is about the connection to the Steam Railway. Do all the hundreds of people who have spent 48 years restoring the steam railway as a heritage line want to see their pride and joy being used for an ‘inter-city’ rail link between Whippingham and Ryde? Why not include a rail link between the roads in the tunnel? I am sorry but so many of the expressions and words used in your submission are difficult to understand or relate to. There have been studies in respect of a ‘fixed link’ for almost as long as there were with the Channel Tunnel. The solution finally achieved across the straits of Dover does not allow an unrestricted flow of passenger vehicles in preference to a high speed rail link. The same should be the case here. Up to 2000 people could be conveyed in every ten-coach train under the Solent and the Hire Car and Taxi businesses would not suffer as they would in your scheme. If the Islnad Line were to die the situation will be worse. Thank you for the opportunity to express my views. I sincerely hope that you do not succeed because there are many, like me, who would leave this beautiful and welcoming island. The bridge across the Medina would need to have a lifting or swinging element that would be opened at high tides each day to let high vessels though. Other smaller vessels should be able to pass under at all times. I have been in consultations with the Heritage Steam Railway Directors who have been most helpful and open minded. Nothing is impossible with linking the steam train to the hub, but it would need to make economic sense. Due to the shorter length of tunnel (11 km as apposed to 51 km channel) the Solent tunnel does not require freight trains. Island Line is financially unviable at present bringing in £1 million revenue per annum while costing £6 million to operate. Trains have a habit of being labour intensive loss makers unless providing city to city routes. I hope this goes some way to answer your questions.